Ollie came to us as a baby from New Zealand and had a wonderful career in the showring in Tasmania. After gaining his Australian championship his breeders generously took him back and, with assistance from his co-handler, Phillip Potter, guided him to his New Zealand title. Along the way he won multiple Best in Show and Runner Up Best in Show awards at All Breeds championship shows in both countries. 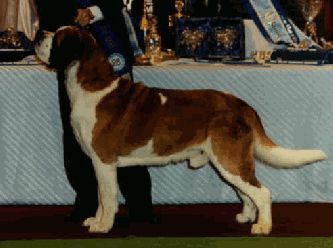 He was also Best in Show at the St Bernard Club of Victoria show in 1997 on his way back to us in Tasmania. Ollie sired six litters and produced a number of Australian and New Zealand Champions. His offspring included Aust Grand Ch Boroniahil Daytona and NZ Gr Ch Orlando of Chenalette.